If you subscribe to the theory that Japanese success in The Tide at Sunrise is dependent on how quickly Port Arthur falls, the next question is, “So, how do you take down Port Arthur quickly?” This article presents an unorthodox (some might say “unethical”) Japanese tactical plan for hastening Port Arthur’s demise. The Tide at Sunrise, a recent board game release from Multiman Publishing covering the Russo-Japanese War of 1904-05, has quite a following among war gamers, myself included. In the standard rules, the entire Naval aspect of the war is totally abstracted out to a set of “Naval Combat Tables”. Japan has one Fleet and Russia has two Fleets: Port Arthur and Vladivostok. Using the Naval Combat Tables, the best case scenario for Japan would be total destruction of both Russian Fleets accompanied by an award of 7 Victory Points. The worst case scenario for Japan would be repeated loss of up to 50% of available Transport Points each turn, follow by a loss of 5 Victory Points if the Russian Port Arthur Fleet ultimately escapes to Vladivostok. 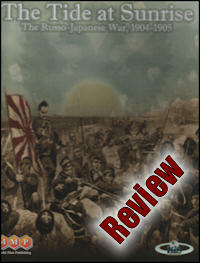 The Tide at Sunrise, a recent release from Multiman Publishing, portrays the Russo-Japanese War of 1904-1905 at a fairly high level (operational or grand operational), with most of the ground units representing divisions, hexes at 6.2 miles (10 km), and each game turn covering one month of real time. The game map represents the Liaodong Peninsula area of Manchuria where the war was fought. I won’t go into any detail on the history of the war (you can do that research yourself if you’re interested), except to say that the Japanese initiated the war mainly to prevent the Russians, who were expanding aggressively in the region of eastern Manchuria and Korea, from totally dominating Korea. In order to sustain an army so far from the Japanese home islands, the Russian fleet at Port Arthur, a much sought after warm water port for Russia, would also have to be destroyed.